Providing enhanced efficiency and ingenuity,� Passport 8� works for many different levels of patient care. 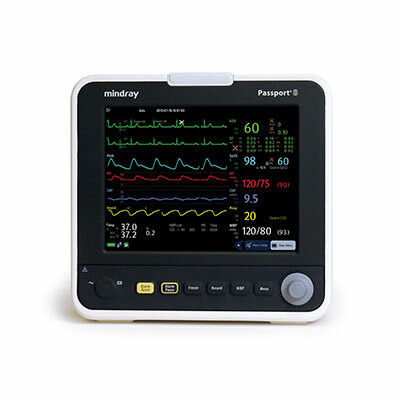 It comes standard with a large 8-inch touchscreen with easy touch function keys and the necessary parameters to meet your clinical needs, such as 3 or 5-lead ECG, NIBP, temperature, SpO2, and respiration. The Passport 8 also includes a plug-and-play modular structure with more advanced monitoring, such as CO2, cardiac output, 2-channel IBP or a combination of the three. Integrated HL7 and DIAP communication protocols set the Passport 8 apart. Both wireless and wired network capabilities also provide better connectivity to the DPM Central Station and Panorama Patient Monitoring System. This allows for a continuous flow of patient data and easy sharing when necessary. Charge Time: Less than 3 hours to 90%, and less than 4 hours to 100% when the monitor is off. Less than 8 hours to 90%, and less than 12 hours to 100%when the monitor is on. Equipo Médico Mindray de la más alta calidad a los mejores precios. Soma Technology es un líder en la venta de equipo médico! Sé el primero en valorar “Mindray Passport 8” Click here to cancel reply.